When you are looking to purchase grilles for trucks, the most important thing to look out for is the right combination of beauty and function - there is no point in adorning your truck with a dazzling grille that is made from inferior materials that will rust or break within a few months. This is why Zunsport specialises in manufacturing one product - grilles that are both eye-catching and incredibly durable, even when your truck spends just as much time off the road as it does on it! At Zunsport, our grilles are crafted from stainless steel and finished in silver or black nylon. Here are some essential points to think about. Stainless steel is an alloy that usually contains a minimum of 10.5% chromium, making it highly resistant to corrosion. In simple terms 'corrosion' refers to every prestige truck owner's nightmare: rust. Not only is it also strong enough for protecting the under-bonnet workings of your vehicle, but it also incredibly easy to maintain and keep clean. This is why three generations of Zunsport engineers have specialised in nothing else! Like all truck accessory manufacturers, at Zunsport we have to find that all-important balance between using lower cost materials and providing grilles for trucks that will give our customers many years of reliable service. Our track record of excellent motorist feedback speaks for itself, and we honestly believe that our grilles provide fantastic value for money when you consider the potential cost of foreign objects such as stones finding their way into the engine compartment or brake mechanisms of your truck at high speeds. You may see cheaper grilles out there, but could you trust them to prevent thousands of pounds worth of damage? What is the finish on the metal? Our stainless steel takes the form of woven wire mesh, and we feel that there is nothing better for ultimate levels of protection on the roads of Britain and the rest of Europe. Aside from corrosion resistance and ease of maintenance, stainless steel creates a premium look – and why settle for anything less? 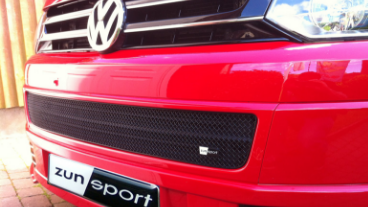 To find out why thousands of truck owners already trust Zunsport for their grilles! Please do not hesitate to get in touch with us on 0300 3032605 - there is also an email form that you can access using the 'contact' button above.